The Ragged End of Nowhere by Roy Chaney, a Mysterious Review. Review: Winner of the 2008 Tony Hillerman Prize for best first novel set in the southwest US and representing the style of the late Tony Hillerman, Roy Chaney crafts a murder mystery surrounding the theft of an unusual artifact in The Ragged Edge of Nowhere. Bodo Hagen and his brother Ronnie went their separate ways following the death of their father. Bodo joined the CIA and was stationed in Berlin while Ronnie joined the French Foreign Legion, a unit of the French Army in which their father also served. When Bodo receives word that Ronnie had been murdered in the desert outside their hometown of Las Vegas, he returns to not only pay his respects, but look into who might have wanted his brother dead … and why. It seems Ronnie had been trying to fence a rare artifact, a wooden hand with a broken finger. A dealer in antiquities believes it may have originated at a monastery of the Russian Orthodox Church, part of a statue of Jesus that was crafted with articulated features that was believed destroyed by fire. Quite unique and very valuable, if it can be found and authenticated. As Bodo continues his investigation it becomes increasingly clear to him that he's not seeing the whole picture, and when certain individuals think he may have the hand, or at least know where it is, his life, too, is in danger. Chaney has a real flair for time and place, deftly painting Las Vegas as a city of hopes and dreams, but also one of disappointment and despair. 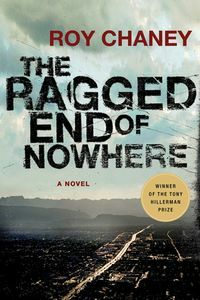 Some readers may groan or roll their eyes believing this is yet another religious artifact thriller, and to be fair, the basic plotline is rather derivative, but The Ragged Edge of Nowhere is far more nuanced. Not only is it exceptionally well written and populated with intricately drawn characters, the artifact's origin will likely come as a surprise, as will the fact that it is a real, historical object. Though not indicated as the first in a series featuring Bodo Hagen, the abrupt manner in which this book ends suggests a sequel with this most interesting character may be forthcoming. Acknowledgment: Minotaur Books provided a copy of The Ragged End of Nowhere for this review.